76534329@N00 – "study of hands"
It was late in spring when I was working the late shift at the library. A woman walked in with a flood of people all around her, or maybe she was well known around town and some of the people she was with were regulars at the library who stopped to chat with her awhile. However, I didn't recognize any of them. As she stopped by the counter where I normally attend patrons, all I could help thinking is 'there's the woman I'm going to marry some day.' After a short while of chatting with her friends, she left the area to browse the book section. I kept looking out for the woman because I wanted to have a second glance before she left the library. I couldn't see which part of the library she disappeared to, but I was fortunate to see her up close as she brought a stack of children's books to check out on her library card. While I was scanning her books into the computer, I could barely take my eyes off her. It's all I could do to focus my attention on her hands, but even so, I couldn't remember to check them to see if she was wearing a wedding band. 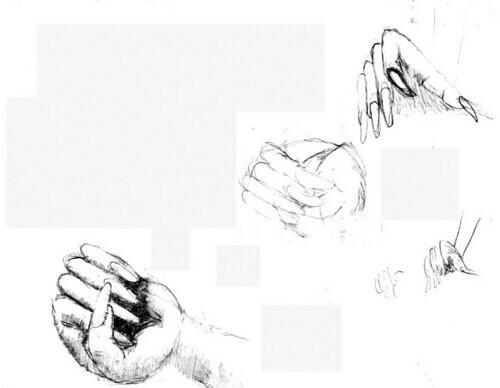 When I got home that day, I pulled out an old sketch book and sketched these hands by memory.